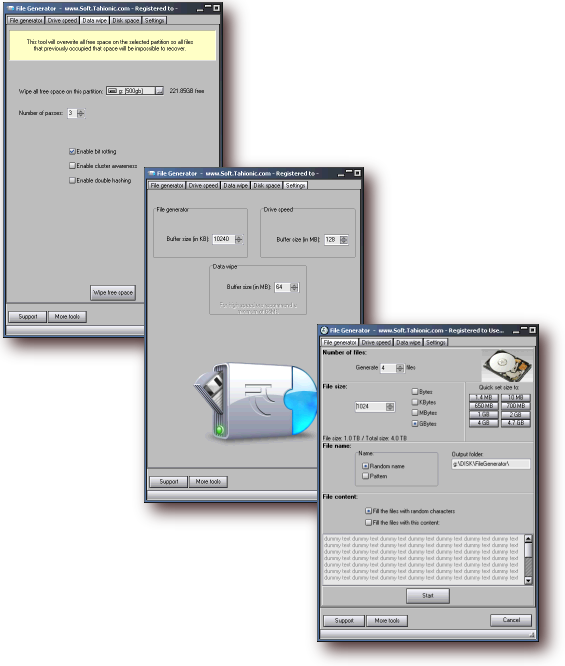 This software tool consists of four modules: File Generator, Data Wipe, Drive Speed, Free Disk Space. The Disk Tools program is currently used by used by many corporations, professional labs, IT publications, hardware review web sites, hardware and software engineers, in performance testes.it doesn't mess your registry or system with unneeded DLL's or other craps like this. File Generator can generate thousands of files. This tool that shows you free space on all drives/partitions. Freeware. This application will help you diagnose system issues by checking the read, write, and search speeds of your drives. Drive Speed is freeware. Qweas is providing links to Disk Tools Toolkit 3.2 as a courtesy, and makes no representations regarding Disk Tools Toolkit or any other applications or any information related thereto. Any questions, complaints or claims regarding this application Disk Tools Toolkit 3.2 must be directed to the appropriate software vendor. You may click the publisher link of Disk Tools Toolkit on the top of this page to get more details about the vendor.